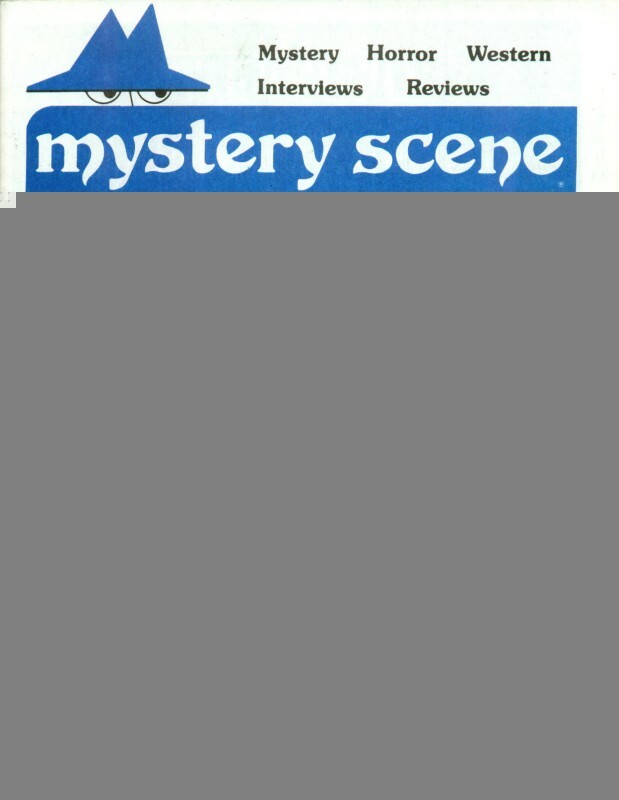 Robert McCammon » Mystery Scene 04/88: "Robert McCammon"
Mystery Scene 04/88: "Robert McCammon"
"Interview with Horror Master Robert R. McCammon"
Webmaster's note: This article appeared in the April 1988 issue of Mystery Scene. 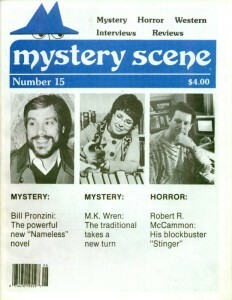 Some readers may recall an interview with Robert R. McCammon in the January 1987 issue of Mystery Scene. At that time, McCammon's novel Swan Song was about to come out. Swan Song, which depicted a nuclear-holocaust and its after-effects, went on to become a bestseller that was acclaimed by critics. His new novel Stinger, due out this month from Pocket Books, is a skillful blend of horror and science fiction set in a small Texas town aptly named "Inferno." It's full of action, believable characters, and, of course, horror, and it's guaranteed to keep readers on the edge. McCammon has established himself as one of the finest stylists working in the horror field today. His writing is deeply steeped in the literary traditions of the South, yet it speaks to all readers, no matter where they live. McCammon's characters, situations—and lush prose—have attracted quite a following for his fiction, which is both entertaining and highly original. Readers unfamiliar with Robert R. McCammon's work should seek out his previous novels. In addition to last year's Swan Song, his books include Baal, The Night Boat, Bethany's Sin, They Thirst, Mystery Walk, and Usher's Passing. He has also written short stories, such as the highly-acclaimed "Nightcrawlers", published in the anthology Masques (and filmed as an episode of the new Twilight Zone series), and contributed an insightful chapter to the Writer's Digest book How to Write Tales of Horror, Science Fiction, and Fantasy. Though in the midst of moving and, as always, hard at work on a new book, McCammon graciously consented to the following interview for Mystery Scene in which he comments on his own writing, his influences, the Horror Writers of America—and, of course, Stinger. Let's start with your new novel, Stinger. Despite the multiple horrors it depicts, the underlying message seems to be one of hope—that man is capable of overcoming tremendous odds. Was this a conscious theme? Yes, it was. I wanted to depict that sort of thing, especially since everybody was in a rather hopeless situation in the beginning in terms of their town being about to go under—and also kind of hopeless about their relationships with each other. You did a great deal of research on Swan Song. Did Stinger require as much background research? Not as much. I did some research on the sociology and psychology of gangs. I also did some Air Force UFO research but not as much of course as I had to do with Swan Song. In Stinger there are references to the government having found UFO evidence and kept It secret. Do you think this has happened? Well. I don't know, but I wouldn't be surprised. I read a lot of things about UFOs, and there's so much visual evidence. If I tuned in to CNN and they said they'd found some alien bodies, I'd say that really doesn't surprise me a bit. Do you think ET intelligence could contact us? I know we have used radio telescopes to send messages, but they're not getting any kind of feedback from deep space, and there's a kind of feeling that we may be alone. I hope that's not true. I think that some day, there will be contact. I don't think it'll be that soon. Do you think the results could be something like you depict in Stinger? Stinger has thrills and scares galore, but also maintains a sense of fun. It's an adventure. Did you have fun writing it? Yes, I did. I really enjoyed it. It was fun. It was difficult at the end. When you're writing a book and you get to the very end, it's like there's a funnel and everything has to come through this funnel to work out. It's difficult sometimes to get it all to come together. Let's talk about your other work. Were you pleased with critical and reader reaction to Swan Song? Yes, I was very pleased. The critical and reader reaction to Swan Song was all I'd hoped it would be, and more. Has your opinion of the world situation changed since Swan Song was published? Do you feel the book's under lying message—the threat of nuclear holocaust—should still be a major concern for Americans and the world? I think the recent INF treaty has eased tensions somewhat, regarding the problem of nuclear weapons, but the atmosphere of hatred remains. Swan Song is about a nuclear holocaust on one level, but I think it also addresses the atmosphere of hatred. For instance, in Swan Song, even after the world's been blown halfway to Hell, people still want to band together in little ragtag armies and fight against other ragtag armies. That's basically what I was getting at in Swan Song—that the atmosphere of hatred has to change before you can have any breakthrough in peace. And, unfortunately, treaties have never made anyone feel secure very long. I think until our leaders understand that we all have to share the same world—a very fragile world—we're going to have this overwhelming atmosphere of hatred. Your writing is obviously what most people would call "mainstream," though it's still definitely in the horror genre. Do you see yourself staying primarily in horror, or have you considered branching out into other genres? I love horror fiction. I think horror literature is the basic primal scream of humanity, and I love its traditions and trappings. So I'll probably continue to write horror fiction for the foreseeable future. Yet I realize that I'm trying to combine horror fiction with other—and I hate to use this term, but I guess it's inevitable—"genres." I want to blend horror fiction with history, Westerns, science fiction, fantasy, biography—whatever I can think of. Horror fiction is great because it's elastic; you can bend and mold it and come up with so many different forms. It's always redefining itself and changing, and I think that's a very healthy indication. Indeed, Stinger combines elements of science fiction with horror, which shows how different forms can be created, within a "genre." Does this mean, in your opinion, that traditional horror fare—vampires, ghosts and other supernatural subjects--are no longer valid? I think they're very valid. It just depends on how you handle them. The challenge now is to handle those classic subjects in original ways. That's difficult to do, but it's a great challenge to try to come up with a different way to frame the classic stories of horror. You have mentioned in other sources that Stephen King was an influence on your early writing. Are there any other writers—horror or otherwise—who have influenced you? Any favorites? Yes, King certainly was—probably too much so. I also enjoy Ray Bradbury, Harlan Ellison, and Peter Straub. Of course, I'd have to rank Edgar Allan Poe as one of my main influences, but I probably read all those old masters, like Jules Verne. H.G. Wells, Edgar Rice Burroughs—the classic writers. You have established yourself as a "hardcover" author, yet Swan Song and Stinger are both paperback originals. Some writers might view this as a step backward in your career. How do you feel this affected your career? Well, I had two novels—Mystery Walk and Usher's Passing—in hardback. I'm not sure that "establishes" me as a hardcover author, but I do understand that some writers would consider it a "backward step" to return to paperback originals. First off, I wanted Swan Song to be read by the largest possible number of people. I also didn't want to have to cut any of it, and I wanted the price kept down on it. So my decision to return to paperback originals did affect my career, in a very positive way. Swan Song has sold more copies than anything I've written up to this point. Do you see a real distinction between paperback and hardcover? Is there any snobbism involved? There is a snobbism involved between "hardcover" and "paperback," and I find it unfortunate. Ridiculous, even. As an author, you're writing to be read. I don't know of many people who can afford to buy a book for upwards of fifteen to seventeen dollars. I will on occasion, but it's not very often. So, again, I write to be read, and if I can find readers through a paperback original publication program, what more could I want? The Horror Writers of America seems to be becoming an important organization that will help further the recognition of horror as a vital and valid genre. As one of the founders, do you feel the HWA Is going in the direction you envisioned? I'm amazed at the Horror Writers of America. It's rapidly growing, and I just can't believe how well the organization is doing. It obviously does fill a need for many, many people, and it provides a business forum that wasn't there before. So, yes, it certainly is going in the direction I hoped it would go—only much faster! Do you think the HWA will have an impact on the way horror writers are treated by the publishing community? I do think HWA will have an impact on the way horror writers are perceived by the publishing community, because there's strength in numbers. Anytime you can put together a body of people who have shared experiences in publishing, and you have a leader who can confront shoddy business practices, you're going to make a difference in how things are done. Already a lot's been done to define what a "fair" contract should be, and to help beginning writers understand how the marketplace, agents, and the publishing business really work. I'm very proud of HWA, particularly its first president, Dean Koontz, and its current president Charles L. Grant. Both these men have done and are continuing to do a lot to advance the Horror Writers of America. Many writers who have commented on the horror genre, among them Dean Koontz, seem disturbed by some of the current trends in horror, especially the graphic violence in some novels and such sub-genres as "punk" horror. How do you feel about these developments? I'm not too concerned about graphic violence or "punk" horror. Again, I think horror fiction is elastic and can be molded in many, many different shapes. I don't personally read a lot of fiction that contains very graphic violence, but I'd have to say also that there's a place for graphic violence. It doesn't disturb me in the least. It's part of the human condition too, so why not show it? Work in that vein will either find its audience or not. I do think, though, that the story has to come first—the plot, the characters, the emotions that power a book—instead of a novel being based on gore and special effects. For me, that wouldn't be a very interesting reading experience. Do you read much current fiction—in horror and other genres? If so, which new writers do you consider worthy of notice? I read a lot of history and biographies while I'm working, but rarely any fiction. I try to catch up when I'm between books, but it's difficult because there are so many books coming out these days. Also a lot of new writers. There seems to be a fresh wave of new writers working in the horror field, and it'll be interesting to see who breaks out of the pack in the next three or four years. In an interview in The Horror Show, you said Hollywood had been in contact with you regarding future projects. Has there been any progress In this area? I have some things optioned, but who knows? You never know where Hollywood's concerned until you see it on the screen, and even then you might hate the result. Are you still reluctant to do screenplays? Yes, I'm still reluctant to do screenplays because I don't like the thought of working by committee. One of the main reasons I became a writer, I think, is that I enjoy being in control of my alternate world and its characters. I don't think I'd like to be told by somebody at a big table that he has a brother-in-law with red hair that he hates, so a particularly wicked character in a story who gets a shish-ke-bob skewer though his guts at a family picnic ought to have red hair. I wouldn't like to be working under the power of a committee's whims, so I'd rather continue working in wonderful solitude, thank you. What's your next writing project? Are you currently working on a novel? I'm currently finishing up a new novel that's very different from anything I've ever done. Is it a horror novel? Yes and no. It's set during the spring and summer of 1944, in France and Germany during World War II. Anyway, I'm excited about it. Do you have any short stories coming out in the near future? I've recently finished a book of short stories and novelettes for Pocket Books, called Blue World, and I believe Pocket Books is going to reissue Baal, The Night Boat, Bethany's Sin and They Thirst. You obviously feel horror is an important field. Do you feel it has finally been established as a permanent genre--like mystery and science fiction? Do you think publishers and the reading public are becoming more accepting of horror? Yes, horror is now a permanent cornerstone. I think publishers and the reading public are much more accepting of horror, but it's still vital to do the best possible writing you can do, to stretch both yourself and try to remold the horror genre to your own particular—or should that be peculiar—vision. Horror fiction is very old and time-honored, and there's been some fantastic work in the field, but I think the best of it is yet to be born. Do you have any advice to offer beginning writers? Would you advise them to work In a field such as horror or mystery? Any other final comments? I'd advise beginning writers to write what they feel passionate about, whether's it's horror, mystery, science fiction, or whatever. Passion is the beginning of the writing process. The more strongly you feel about something—about a subject, about a character, about a theme—then the more strongly it will communicate to the audience. Also, keep working! There will be plenty of people who will reject you and say you can't do it. The secret—no secret, really—is to write every day. Find a place to work and do the work there every day, and that's the only way to get a book accomplished. But don't give up! Never give up!